Photograph courtesy A Forster 25021 pulls into Millerhill on at 6pm on the evening of July 2nd 1980 towing 08755. By the end of July 25021 will be out of service at Haymarket with collision damage to one side. The nineteen year career of D5171/25021 started out on the North Eastern Region, spending fourteen years at a variety of Eastern Region depots before moving to the Scottish Region. December 1967 to Leeds Holbeck (55A). January 1971 to Thornaby (51L). March 1971 to Leeds Holbeck (55A). October 1971 to Gateshead (52A). August 1972 to Tinsley (41A, later TI). September 3rd 1980 - withdrawn. 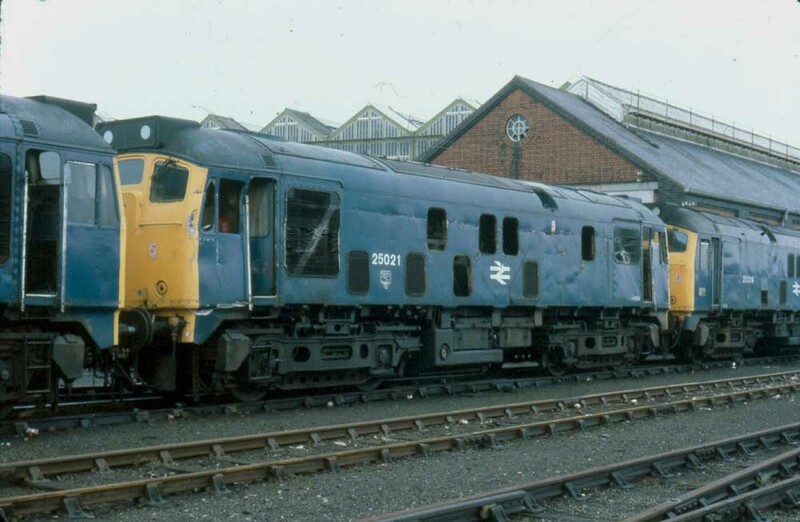 25021 was the 38th Class 25 to be withdrawn, one of nine Class 25s withdrawn during September 1980. After withdrawal 25021 was stored at Millerhill. On October 10th 40006 hauled 25001, 25013, 25019 & 25021 as far as Thornaby, and reaching Swindon Works by October 16th 1980, 25021 was broken up by the middle of December 1980. Its October 26th 1980 and the convoy of locomotives from Millerhill including 25021 has reached Swindon Works. This view reveals the damage to the side and cab that led to its premature withdrawal. Noted Darlington Works January & February 1964. Noted Doncaster Works August 1965. Was probably due for a Works visit in early 1973, did it get called to the Works? Noted Glasgow March & April 1978, repainted - GW paint date 29.4.78. On July 27th an Ushaw Moor - Redcar roundtrip (?) day excursion was worked by D5171. The evening Wakefield - Guide Bridge parcels was hauled by 5171 on December 5th. A four times weekly Tribometer train was run between Sheffield & Knottingley, commencing February 10th, with 25021 handling the first working. This working ceased earlier thank expected, many of Tinsley's Class 25/0s handled the workings with 25017 being the most frequent. 25007 & 25021 were noted at Ipswich on July 26th with the empty stock of a Glasgow - Brandon troop special. Photograph courtesy Ian Hammond 25021 at Dumfries on July 24th 1976. On August 18th the 10.44 Glasgow Queen Street - Dundee and the 13.38 Dundee - Glasgow Queen Street were worked by 25021. 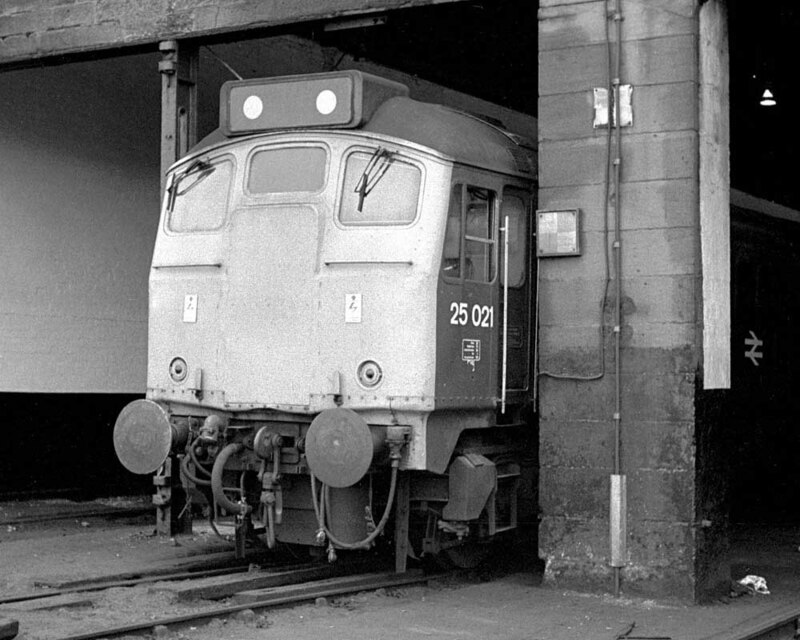 Photograph courtesy Tony Sayer 25021 at Motherwell shed on October 29th 1977. 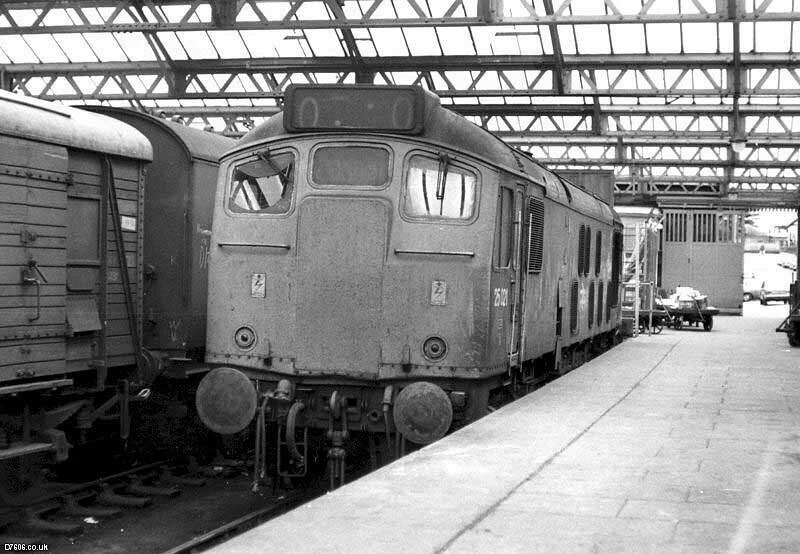 On June 5th the 14.44 Glasgow Queen Street - Dundee and the 17.33 Dundee - Glasgow Queen Street were worked by 25021. The 08.44 Glasgow Queen Street - Dundee was worked by 25021 on July 24th. 25021 was noted at Inverness shed at breakfast time on August 10th. On September 30th 25021 assisted the LCGB Ayr & Galloway railtour in hauling the passenger train the short distance from Stranraer station to Harbour Junction to allow release of the two Class 40s, 40171 & 40191. 25021 was noted at Dundee depot on February 18th. The 11.05 Perth - Edinburgh was worked by 25021 on June 15th & July 20th. On August 22nd the 13.38 Dundee - Glasgow Queen Street was worked by 25021. On September 19th 25021 worked the 22.45 Carstairs - Edinburgh. Three days later (22nd) the 07.38 Dundee - Glasgow Queen Street, 12.44 Glasgow Queen Street - Dundee and the 15.38 Dundee - Glasgow Queen Street were worked by 25021. The 17.10 Perth - Arbroath was worked by 25021 on May 23rd. On Sunday February 17th 25021 was noted with a track layer on permanent way work at Burntisland. 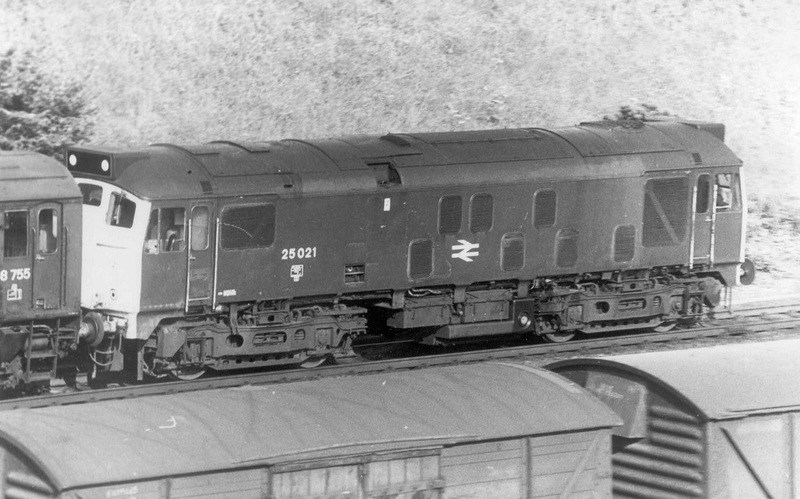 Although 25021 was not boiler equipped it had been used by the Scottish Region on scheduled passenger working during the summer months. Perhaps one of its more interesting workings was on May 23rd when it came to the rescue of 20110 & 20119 working the 1N21 09.45 Edinburgh - Inverness at Aviemore. 20119 had earlier failed at Kingussie, 20110 soldiered on along to Aviemore where 25021 was added for the run to Inverness. 25021 was noted on July 31st out of use at Haymarket with minor collision damage, a lengthy scrape high up on one side and damage to the radiator grille, boiler room grille and other ventilators. It had moved to Millerhill for storage by September 2nd 1980. 25021 was withdrawn on September 3rd 1980. Page added March 9th 2012.